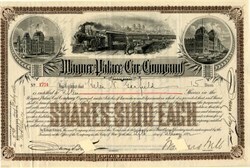 We are offering this beautifully engraved authentic Stock Certificate issued by the WAGNER PALACE CAR COMPANY dated in the 1890s for 100 Shares. This item has an ornate BROWN border and Shares $100 Each underprint. There are THREE vignettes. 1.-Upper left, is of the original Union Station in Chicago that burned in the Chicago fire. 2.-Upper right, is the original Grand Central Terminal in New York City. 3. -Center is a passenger train, with sleeping cars, probably leaving New York for Chicago as Grand Central Terminal is in background along with the Brooklyn Bridge. Punch cancelled. This company was controlled by the New York Central RR and in competition with the Pullman Co. for sleeping car patrons. This stock is signed by W. S. Webb, who was the son-in-law of William H. Vanderbilt. There are a number of small cancellation holes in body of certificate and block cancellations in the signatures which is typical of most of the Wagner Palace Co, certificates. Nice certificate from a company offering a means of travel now gone. Wagner became a part of Pullman Company on Jan 1,1900. The actual certificate looks much nicer than the scanned image.